A family of orca swim peacefully through the waters off Northern Vancouver Island in British Columbia, Canada as the sun begins to set. An Orca family consisting of two large males and one female cruises the waters off Northern Vancouver Island in British Columbia, Canada as the sun sinks lower into the horizon. The water is calm and the wind is at a standstill as the sun reflects off the water and gives the mist from the Orca's blowholes a yellow tinge. Magnificent sunsets with such awesome colors are a common sight off Northern Vancouver Island but to actually capture a photo with the sunset as well as an Orca family in the picture is in the luck of the draw. Orcas are wild and can appear in the massive ocean anywhere at any given time so be sure to always have a full roll of film ready in your camera. ... The ideal months to go whale watching off Northern Vancouver Island in British Columbia, Canada is from July to October where you can usually locate a variety of different Orca families from the Northern Resident groups. 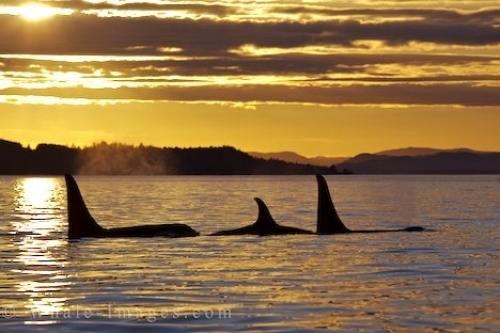 Killer Whales off Northern Vancouver Island, British Columbia, Canada, Orcas at sunset. Like sunsets? Here you find a bunch more of colorful sunset pictures photographed by Rolf Hicker.